Fruit nail designs make the nail looks chicer as it has a great variety of colors that help it look vibrant and lively. People have always wanted to get their inspirations from nature. The colors and patterns of nature are heavily used in the fashion industry. Nail designs are no exception in this regard. Nail artists are inspired by different flowers, fruits, and other natural phenomena while designing the nails. Fruit nail art is one of these designs where the artists use the color and pattern of different fruits to adorn the nails. Summer nails usually refer to the use of bright colors in nail art and designs. Almost all the fruit nails designs are colorful and they can be considered summer nails too. The process is simple. Draw the images of the fruits or fruit slices as per your choice and use a base coat which seems fit with the fruit images. One can also use nail decals and stickers or 3D nail art while having fruit nails. Let’s learn how you can design the nails with fruit nail art. This could be an amazing nail design which is both glamorous and a variant of fruit nails. 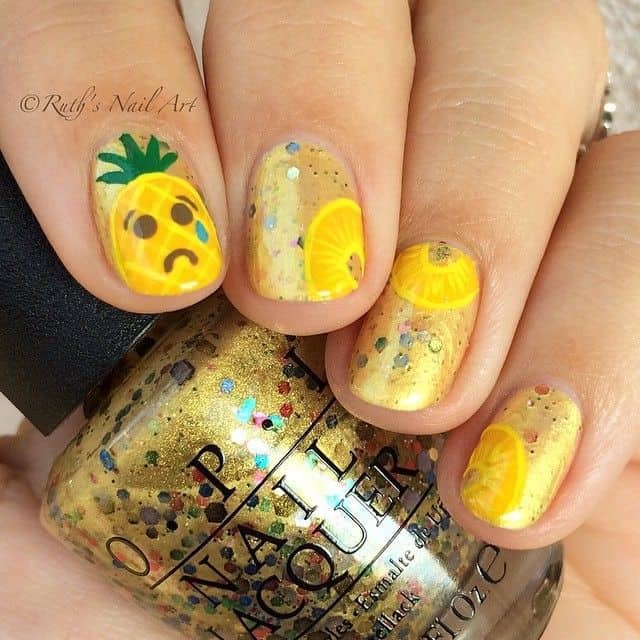 Apply a golden base coat to the nail plates and draw the images of pineapple or pineapple slices to make it look like fruit nails. You can add glitters to make it look luxe. Watermelon is one of the most used fruits in fruit nail art. The green and red nail combination of watermelon are perfect to pick a great design out of these colors. You can use 3D nail art to have fruit nails like these. Whether you use a malta or an orange, the slice will look almost the same. Use orange color to fill the surface of some of the nails and keep the others white. Then paint sliced oranges or malta on them. Orange nail color will give a contrasting look on the white bases. The red color nails of an apple are appealing more than any red colors of the fruits. Apple has a good reputation as a fruit, so do it in nail designs. You can use the red beauty of apple at the fingertips to get some stunning fruit nails. This is one of the simplest designs you’ll ever encounter. Keep it simple. Use a nice base coat which will complement the color of the fruits. Then, draw the images of some fruits to make it look gorgeous. Pineapple, guava, strawberry, and watermelon have been used here. Fruit nail art can be used as an alternative of summer nails for the vivid looks it has. You can get inspiration and guideline from this design. Some images of fruits and bright colors have been used to create a summer ambiance on the nails. If you want to get a standard design by using the pattern of different fruits, this is the perfect pick for you. The pattern looks so distinctive and beautiful if they are sliced right across the middle of the fruits. One can use these patterns of sliced fruits to get this design. Like the idea of balanced diet, you can depict balanced fruits at your fingertips. Different kind of fruits is placed here keeping a good balance in terms of the amount and vitamins. If you are a fitness maniac, these fruit nails will be a great company of yours which is compatible with your personality. Grape vines are really beautiful in real life. If you are a fan of them, paint some grapes on your nails. The hanging grapes will give an amazing look to the nails. The combination of purple nails and green colors will add a new dimension to this fruit nail art. Cherry fruits are cute looking small fruits which are used in many designs including designs of attire. You can depict this cuteness on the nails by using the images of cherry fruits on the nail plates. Draw some images of cherry fruits at the fingertips to get such fruit nails. Creativity is the prerequisite of being trendy. If you can’t modify the designs your own ways, you’ll lose the track. So, try these designs using your own innovation. A bit of modification can make a great impact on the fruit nails designs.